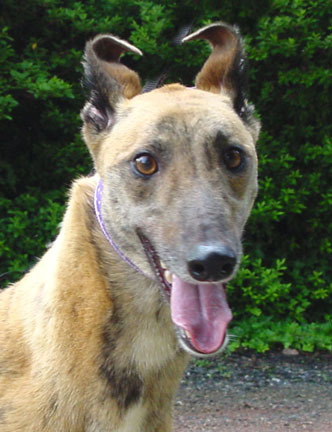 Fostering greyhounds is one of the most important and rewarding things that we do. We are always in need of more foster homes because we do not have a kennel facility. We rely 100 percent on our wonderful foster homes and can only take in the number of greyhounds that we have foster homes for. We have foster homes in several areas in three states, SC, NC and GA. So check with us to see if we are set up for fostering in your area if you are interested. In most cases a dog goes directly to the vet from the track. There they are checked over, vaccinated, spayed/neutered, wormed and receive all needed medical care. Greyhound Crossroads pays for all the vetting, of course. We do ask our foster homes to make arrangements to pick up their foster from the vet or from one of our volunteers when they are ready to go into foster care. Since we don't have a kennel to hold dogs in, this is very important. Fosters are tested for their responses around cats, small animals, and children and placed in appropriate foster homes. All fosters come with the kennel muzzle they wore at the track. Because of the number of dogs at the track, greyhounds are only allowed out of their crates after putting on the muzzle so we ask that foster homes continue this practice. We are lucky that we have the muzzle to use as a tool around our other pets to keep everyone safe. It also prevents damage to your house from chewers and keeps the foster from eating something that might hurt it. The muzzle is like our group's insurance policy that will prevent large vet bills if it is always used so we do require that foster homes use the muzzle. Keep in mind that your foster has been living in a crate at the track. Most have never been in a house before and can be very nervous being left alone in a house full of strange things. For this reason we encourage you to continue using the familiar crate whenever you can not supervise your foster. We will supply you with a loaner crate for your foster if you need one. Whatever your opinion is about crates; it really is kinder to start a greyhound out in one because of their unique upbringing. Crates also keep your other pets, your house and the foster safe. They are a great tool to use for potty training too. Your foster may try to refuse to go into the crate at first because it is not "his" crate yet, but they easily accept this new crate as "their new home" after they have eaten a meal or two in it. Introducing fosters to other breeds of dogs or cats, must be done carefully. 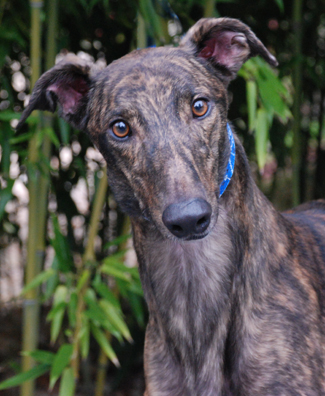 Most greyhounds have never seen cats or even other dog breeds other than greyhounds. They probably will not know that other breeds of dogs that look different from a greyhound are even dogs. To them a furry dog may as well be an alien. A small dog could be mistaken for a rabbit or squirrel. It is important to use the greyhound's muzzle when introducing them. Remember sighthounds are triggered by movement so they will be more successful with a small dog or cat that is still and confined to a small area so it can't run. Indoor introductions are much better than outdoor intros. Dogs recognize other dogs by sniffing their butts so this is an important part of the meeting and should be encouraged. More info on introducing your foster greyhound to other pets. Greyhounds have never been in a home before and seeing their wonder at all the new things is one of the most rewarding things about fostering. They often do not know about stairs, sliding glass doors, window panes, mirrors or slippery floors. Patiently teach them about your home. Greyhounds are fast learners so within a few days most have made themselves comfortable. Be careful not to accidently reward a fearful response by petting the greyhound and telling it it is "OK" or that it is a "good dog". That can make the fear worse. Reward the dog when it approaches something calmly or does something new successfully instead. Greyhounds are usually easy to house train. They are taught at the track not to soil their crates and to go outside the kennel building to relieve themselves. We recommend keeping the foster on a leash so you can keep track of where they are at all times until it has established the habit of going outside. Any potential accident can be avoided and becomes a learning experience using this method. We keep them crated any time we can't closely supervise them during potty training. Most greyhounds learn within a few days to relieve themselves outside and many never have the first accident inside using this method. All greyhounds have had experience playing with toys, since the lure they use at the track is a soft furry toy. Soft, squeaky, stuffed animals are usually a favorite with retired racers for this reason, but they may not know what to do with it when it is just laying on the floor and not moving. If your foster doesn't seem to know what to do with a toy that is laying there, try dragging the toy around with a rope. Sighthounds are attracted to movement and the lure moved at the track. Most greyhounds aren't interested in chasing balls or fetching sticks. Supervise playtime closely if more than one dog is involved. Any dog can get protective of their toys and this should never be allowed. We recommend feeding your foster in its crate to help it accept it as its den. Nervous fosters that may skip a meal or two at first and seem to be more likely to eat if you put them in a crate and walk away. We recommend feeding good quality kibble with no corn, wheat or soy in it. Look at the ingredients and look for ones that have at least 2 meats listed in the first 5 ingredients. We like Costco's Kirkland brand as a good quality, reasonably priced food at around $30 for a 40lb bag. Since greyhounds eat moist food at the track, they are likely to choke on dry food. We add some water to the dry food at first. Never feed your foster and your dogs together! Food and bones are the things that dogs are most likely to fuss about, especially with a new dog in the house. We provide our foster homes with food for their fosters! You can do as much or as little training with your foster as you have time for. Most of our foster homes have busy lives and we don't ask that you teach a dog to sit, down, stay or other obedience commands. Most foster homes just have time to work on the basics like potty training and teaching the foster good manners like leaving food alone when people are eating and not to counter surf. Foster homes with stairs usually teach the fosters to do those. Some homes also work on their foster's leash manners by taking it for walks. Most of our foster homes are not obedience trainers and that type of training is not expected. In most cases your foster will not be with you long enough to teach much more than the basics. One of the most important things you can do as a foster home is to keep us informed of your foster's behavior weekly and take cute photos. We want to know the cute things it does, as well as the "not so cute". We use these updates and photos on our website to attract potential adopters. Information helps us find the best possible family for your foster. We make updating easy by providing the Greyhound Crossroads Facebook Page for foster homes to post photos and updates on. You can also send us private messages or emails. We have adoption events in high traffic areas like pet stores and festivals and we ask foster homes to bring your foster out to the events in your area, if possible. Your area adoption rep will approve or deny adopters and take care of home visits with potential adopters, that is not something that the foster homes need to worry about. We welcome your input and you are always welcome to accompany an adoption rep on home visits with your foster though. Foster homes don't do adoptions, your area adoption rep also takes care of that. You are not required to have strangers in your home to meet a foster and can pick another place to meet if you prefer. If someone contacts you with interest in your foster please notify your area adoption rep to make sure that person is approved to adopt and that your foster doesn't have someone else already in line for it. Never move your foster to another foster or adoptive home without clearing it with your adoption rep. Many foster homes fall in love with their fosters and decide to keep them. We are always happy when a dog finds a new home, but we do encourage you to foster a couple of dogs before you keep one if you can. Once you foster a few, you will realize that they are ALL sweet and nearly perfect. Foster homes have first dibs on any greyhound currently in their home until an approved family chooses to meet that dog for possible adoption. If you decide your foster is staying permanently, we ask you notify us right away and complete the adoption as soon as possible. We don't want to confuse potential adopters by having dogs up on our website that aren't actually available. appreciate foster homes that can only foster for a limited amount of time too. Greyhound Crossroads pays for each dog's vetting and we supply you with a crate if you need one. We pay for the initial worming, initial flea and tick treatment and our vets give the dog its first heartworm treatment. Foster homes should have no health related expenses for the first month. GC will also pay for emergency treatment - please call our director Kim Owens ahead of time for approval or at least phone us enroute if it is a life and death emergency. If you end up having your foster for more than a month you can request heartworm pills to be sent to you as needed. We can usually retreat your foster for flea and ticks if it is with you for more than a month too. You will need to provide your foster with a good quality food - we recommend Costco's Kirkland brand around $30 for a 40lb bag. We will reimburse you for food if you provide us with your receipts. In some adoption areas you can pick up a supply of food from your foster coordinator when you pick up your foster. You may have some minimal transport costs when picking up your foster initially and when taking them to meet and greets. We do not ask our foster homes to deliver the dog to adopters long distances away and ask the adopters to do the driving to keep your expenses down. The minimal expenses you do have may be written off so please keep your gas receipts and give it to your accountant. If you can't foster consider donating to help us with food, meds and transport costs for our fosters. For more tips on how to help your foster get settled please see our The First Week page. We hope you are interested in fostering for us! It is fun and such an integral part of what we do. If you are interested, go to our foster application page and fill it out.